In the middle of the city of Geneva, lies the Rond Point de Plainpalais. The literal heart of the city, tram and buslines meet and intersect there, people come and go about their business, some linger and wait, it is also a popular place to arrange to meet. One can witness this never ending ballet of Genevan life from the terrace of the Café du Rond-Point. With music always playing from the terrace speakers, it is really easy to stay for a long time. I really enjoy the people watching, but I also like the cozy interior that looks and smells just as a neighborhood café should. Always full, the service by the lonely waitress can be a bit slow (why they don’t hire a second one, I’ll never know…) but it has never stopped me from appreciating the atmosphere of the place. 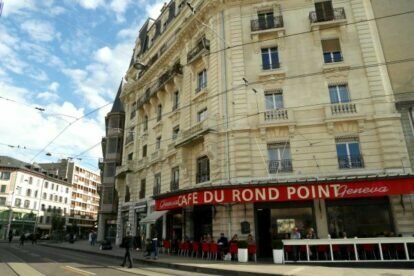 University students talking politics, loud, retired football fans drinking pastis and watching a game and elderly couples enjoying Brasserie style cuisine, you will find a wide cross section of Genevans at the Café du Rond-Point. My favorite time to go there is summer Sunday mornings. There is nothing better than sitting outside in the sun, at the only time when the Rond Point de Plainpalais is a bit calmer, and listening to jazz while sipping a coffee and munching on a croissant or a Jambon-Beurre (French sandwich with ham and butter).